One of the many tattoos I have is of a Dorje. A Dorje is a type of weapon mentioned in one of the four canonical Hindu texts. The Dorje was the weapon of the ancient god Indra, (the god of heaven). According to the text, Indra would use the weapon to kill sinners and ignorant persons. In Vaj-ra-ya-na Buddhism the Dorje or as they call it the Vajra, is used as their representational symbol. This path of Buddhism is referred to as the “Thunderbolt Way" with the ‘thunderbolt’ being enlightenment - One moment I am not enlightened, and in the next moment I am no matter how long it took to get there. I got the tattoo after a few trips to India and Nepal, because, I had a personal spiritual 'thunderbolt' experience - a deep experience of being released from suffering. At the time and in my own arrogant ignorance, I had the belief that I had reached my spiritual peak, an experience where my consciousness had been released from a significant portion of the suffering caused by my attachments to the past, the stuff of life and to much of life itself. I had assumed that having been changed, and I had changed, all that remained was for me to bask in this glow of spiritual light (en-light-en-ment) and enjoy my new found freedom from suffering --- simply working to maintain my new 'converted' state of being. I had greatly underestimated the depths of what enlightenment - or conversion - truly consists of. I had no understanding as to the long term commitment I had made when I accepted Our Father’s Plan of Salvation before my birth. At this time I was not even consciously aware of His plan. How happy I am to know, now, many years later, that spiritual thunderbolts can and do strike the same person, not just twice, but seemingly countless times. How excited I am to know that I can expect to be struck for many many years to come. The thunderbolt experience that prompted me to get the tattoo, was real, one moment I was one way, and the next I was dramatically changed. I had truly been enlightened, I had been converted, but now as I ponder my conversion within the context of my lifetime, I realize I have made this ‘now I have it, I’m all set’ mistake many times in my past. As I look at my conversion timeline - I suspect the first thunderbolt hit when I was about 5 years old when as the son of an agnostic mother and atheistic father with Jewish roots, I wanted to be a priest, not even knowing what a priest was but understanding that they were somehow attached to God. This first thunderbolt was also a big hit within my family – the first shock of many to come! The next major strike was my ‘Yes’, to an alter call at an Assembly of God at 16 years old. Then the bolt struck and I turned away from the church towards New Age ‘enlightenment’ using rocks, crystals, tarot cards, mysticism, and physic channels to enlighten myself. From there it was money that drove my every effort until that proved to be pointless and I was left with nothing but numbers. Then in 1990, I was struck yet again, and I eventually became an Episcopal monk. After years of study and prayer I left monastic life and entered recovery and the thunderbolt of the 12 steps converted me yet again. I asked My Heavenly Father for an individual relationship with him. I became bold enough to ask for the relationship I had always known we both wanted. I said basically - “Here I am, if you want a relationship with me, I want one with you. Reveal yourself to me and I will follow you wherever you lead.” It was with these words I left all doctrine behind - and started a new search for truth, waiting on Him as I lived my own religion. I first met with missionaries 12 years ago. I met with them on and off for several years until about 6 years before I was baptized I met with sisters and was dropped, but before I was dropped one of the sisters wrote in my teaching record, 'Some day he will baptized, right now he is just confused". It was only inspiration that would prompt her to write this as I had no real desire. Last December (2013) just over a month after my father died, a new elder came to the area, they had no investigators, no potential investigators and no leads. On his first day this elder went exploring in the attic of his new home and found an old area book, one with my name and the comment from the sister 6 years prior. He brought it down and gave me a call. He said; "You have met with missionaries in the past, would you like to meet with them again?" Having just returned from being the primary care giver for my father on Hospice and experiencing a true miracle with him, I immediately said yes and we set up a time to meet later that day. Over the next eight months, I tortured them all with difficult questions, not intentionally torturing them, well, at least not intentionally all the time, but no matter my intention or the difficulty of the question, they always sincerely and intelligently came back with appropriate answers, even if the answer was ‘we aren’t sure’. I learned of the Plan of Salvation, Spirit Prison, Personal Revelation, the Apostasy, Pre-existence…. Each of these points of doctrine rang true to me – and they all in their own way – were confirmations of the truths I had found in my own spiritual journey – truths I had come to believe through doctrines I had found and experienced, in the other religions I had followed. The Elders challenged me to read the Book of Mormon in two weeks, so I read it in eight days. Each time I asked Our Father about the truthfulness of His Church I always heard the spirit confirm positively through a simple word of ‘yes’ – I repeatedly heard The Church Of Jesus Christ of Latter Day Saints was indeed His Church and the Book of Mormon was true. Even though I heard it, I could not accept it, even to the point where I tried to imagine what a ‘No’ might sound like, but I was never able to even imagine hearing no in a convincing way, the Church and the Book of Mormon are indeed true. From this point on, my problem was not in receiving an answer, it was in my having the faith to accept the answer I was repeatedly receiving. My involvement with the missionaries and the Church increased even more and I began to feel a part of the Church family. Eventually I met with the Bishop. After a great conversation regarding my experience and his, he stated that I could remain a ‘friend of the family’ as long as I liked and would always be welcomed in Church but that I would not receive all the blessings God has to offer until after I am baptized, we spoke of a leap of faith…. Later, I and the missionaries met with President Packard, the mission president. In our conversations we discussed many things, but for me the most powerful moments were also in regards to me possibly needing to take a leap of faith at some point. Having accepted most of the doctrine and feeling accepted and welcomed, I had yet to overcome my hesitations with accepting Joseph Smith as a prophet and all that comes from that foundation of the Church. I read a great deal about Joseph Smith, the anti-Mormon teachings, all the difficult truths, LDS doctrine and the official history of the Church and despite these hard conversations, well maybe even because of them, I slowly began to develop a testimony of Joseph Smith, not through his strengths as a prophet, but through what I saw to be his weaknesses as a man and the struggles he must have faced reconciling the two. I began to see Joseph the prophet though seeing him as a man, a man like me. 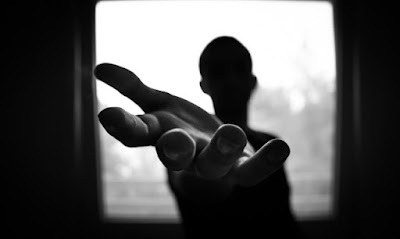 I became empathetic towards him, and I could easily envision what it must have been like to be touched by the divine and yet struggle with being truly human. I had put off the memorial service for my father for many months. While I was away I decided I would not be baptized. I did, however decide there were many truths in the restored Gospel that I wanted to remember so while I was in Annapolis preparing the memorial I went ahead and got an Angel Moroni tattoo on my arm to remind me of the truths I had found in Mormonism. I had been struck by yet another lightning bolt and felt it would be best to just move on. I returned home I was going to tell the Elders, thank you but no thank you. When we met they knew I was pulling away and they talked about intent. Had I been asking with true intent? I realized that I had been asking because I wanted to know, not because I wanted to change. I knew I needed to pray with the willingness to do whatever I was asked should I receive an answer. 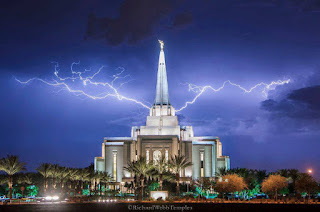 After the missionaries left that day, another lightning bolt came, this one as powerful as any but still as subtitle, as His still small voice of truth. This was my ‘tipping point’. I went upstairs motivated to pray with 'intent' but along the way I received a very strong impression that I was not to wait, not even a second - so I prayed on the stairs. I got on my knees and prayed to know if the Book of Mormon was true, If Joseph Smith was prophet and if the Gospel had been restored. I was certain I was going to receive my answer so I prayed with one eye open - looking for the heavens to part, an Angel to appear, something miraculous but much to my disappointment, nothing happened. I stood up, disappointed and started up the stairs again. “And Christ hath said; If ye will have faith in me ye shall have power to do whatsoever thing is expedient in me. And he hath said: Repent all ye ends of the earth, and come unto me, and be baptized in my name, and have faith in me, that ye may be saved. And now, my beloved brethren, if this be the case that these things are true which I have spoken unto you, and God will show unto you, with power and great glory at the last day, that they are true, and if they are true has the day of miracles ceased? Or have angels ceased to appear unto the children of men? Or has he withheld the power of the Holy Ghost from them? Or will he, so long as time shall last, or the earth shall stand, or there shall be one man upon the face thereof to be saved? Behold I say unto you, Nay; for it is by faith that miracles are wrought; and it is by faith that angels appear and minister unto men; wherefore, if these things have ceased wo be unto the children of men, for it is because of unbelief, and all is vain. This scripture answered all my questions! 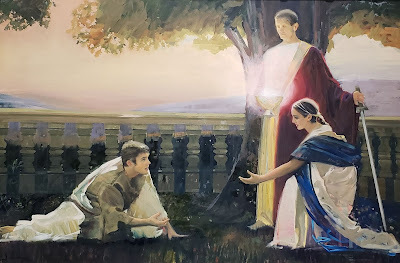 I could make the changes in my life that I needed to make and I could do it with Father's help, the restoration was true and I needed to be baptized with proper priesthood authority, and yes, the day of miracles had not ceased and I too could experience them through faith. 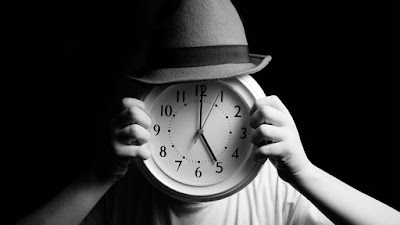 Holding true to form, I immediately closed the book and asked again, is the Church true - then opening the book to a page that spoke about a battle - I knew, I knew that God was giving me me I had my answer - it was time to stop asking – it was now my turn. It was time for me to take that leap of faith, it was time for me to surrender to the truth. From there I set my date for baptism but as I set the date I thought, "Let's see if what they say is true, let's see what blessings come, if they come then I really know, if they don’t, I am out of here." There is so much more to this story, so many details of how the Lord lead me to His church, but these are the main points. 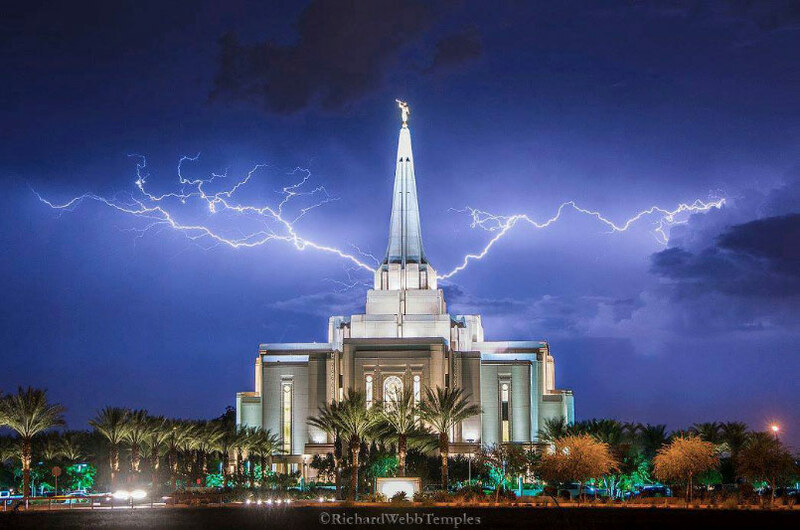 These are the lightning strikes that lead to my accepting the Gospel and choosing to follow Him. What I read in Moroni is true, I have completely lost track of the number of tender mercies and blessings that have come into my life since my baptism. I have had some amazing and sacred things happen since my baptism, I have found freedom from thoughts and behaviors I thought I would die with and been given a perspective of life that makes complete sense – I have found His True Church – a Church big enough to contain the all the truths I have found in every religion I studied. Finally, I have found the place where I can be with my savior and live in the knowledge of the truths I have found throughout a lifetime of searching. Truths that all fit under the banner of Jesus Christ, whom I love. So this is part of the story of my 'conversion story' – but the truth is that the story is still being written – as are all of our conversion stories that unfold every day of our life. The Thunderbolt of conversion is more a path of progression limited only by our willingness to be struck. To be struck we must continually take our leaps of faith. We receive no witness until after the trial of our faith, having received a witness the trials must deepen as we progress towards perfection. As the trials deepen so does our witness.. The thunderbolt of conversion continues to strike each of us as we remain faithful – as long as we do not take upon us - the Lord’s name 'in vain'.